Part of Steiner's M series of military-style scopes, the 1-8x24 M8Xi Riflescope gives you flexibility and high resolution from close quarter to mid-range scenarios. 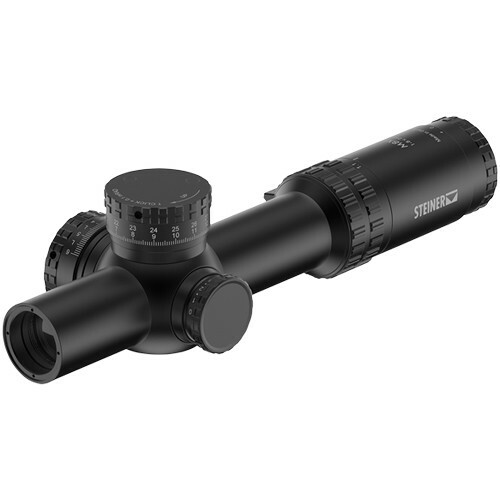 The scope offers a wide field of view and its 34mm maintube permits broad elevation and windage adjustment ranges. The Designated Marksman Reticle (DMR) in the first focal plane features the subtensions necessary for precise aiming. Broadband anti-reflection coatings on all air-to-glass surfaces yield bright details and sharp contrast, even in low light, and the aluminum-alloy tube is purged with nitrogen and trace helium for waterproof and fogproof performance. Low-profile turrets won't clutter your view downrange, and the scope's length (under 11") leaves room on your rail for additional optics like thermal imaging or night vision devices. The adjustable-brightness illuminated reticle is powered by one CR2032 battery.